With Lick Your Plate, their latest cookbook, these sisters endeavour to bring meals humming with deliciousness and humor to your table. Ten years ago, Julie Albert was studying fiction-writing in Toronto, workshopping her murder-mystery comedies in a class full of creative writing students. Frustrated by the sometimes restrictive and stifling nature of prose narrative, Albert began parlaying her talents into the riskier and far more exciting world of the culinary arts. Perhaps it was more than just a whim; Albert has always used her curious temperament as a divining rod to seek out the next big thrill. Teaming up with her sister Lisa Gnat, who at the time ran her own dessert catering business in Toronto, the two women set off on a business venture that has produced, so far, three cookbooks, a webshow and plaudits from the likes of Jason Alexander, Jon Bon Jovi and astronaut Chris Hadfield. 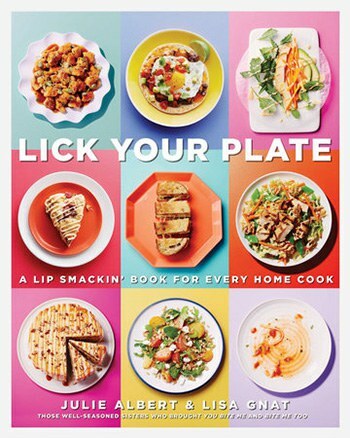 Their cookbook franchise Bite Me has endeavoured, since its 2011 debut, to bring meals humming with deliciousness and humor to the tables of ordinary households. Indeed, the sisters’ working motto, “effortless deliciousness”, is the nucleus of their brand and even just a casual thumb through their latest concoction, Lick Your Plate, reveals the ingenuity of two women who let nothing get between them and a skillet. Much like the meals in their cookbooks, Julie’s and Lisa’s DIY approach to publishing was a recipe for success; touring extensively across Canada on the back of their first book (“with pots and pans in our suitcases”, Albert attests), the two sisters soon gained traction online, cultivating a fan base that, at the time of writing, figures in at over 60 000 followers on their social media. "Why should you trust us? We're sisters (and not the how-do-you-solve-a-problem-like-Maria variety, but the give-me-back-my-sweater kind) who love working and cooking up fun together." "From Lisa's Easy-Bake Oven days, she has been experimenting in the kitchen, developing her bionic palate and original recipes, while Julie hasn't stopped writing since she banged out her first chain letter on her IBM Select I typewriter." "Standing in Lisa's kitchen, I'm constantly forced to make snap decisions. Do I give her the 10 feet of space she demands or do I snuggle up close and make her cringe?" "You know when you're super excited because you think you've discovered something only to learn that someone has beaten you to the punch? This happened to me twice. Once with LED slippers (genius, right?) and again with a little legume called the lentil. It appears that I'm 10 000 years too late to jump on the lentil bandwagon, but better late than never, right?" For her part, Gnat brings the wisdom of her years as chef and businesswoman to the table. Practical yet ready for all the rides in store, the culinary half of the sisters works to create meals that everyone from the single bachelor to a bustling family of seven can enjoy. “I’d classify myself as a seasoned home cook,” Gnat confesses. “I admire the work of the world’s greatest chefs, but really like to provide solutions for the home cook and entertainer. I loved the idea of working with my sister. She's a great sounding board (and recipe tester) and provides inspiration for when I’m at the stove. Though the cookbook shelf is already crowded, I feel that we offer people foolproof recipes, everyday solutions and endless laughs, all rolled into one package. Lick Your Plate is, indeed, a one-stop-shop of ideas which refashions old favourites into entirely new dishes altogether. Divided into the basic categories of soups, salads, pastas, meat and vegetarian dishes, and desserts, the pair present a reinvented set of traditional favourites. Consider their take on risotto, often celebrated for its difficulty. A recipe for Sweet Potato Risotto with Thyme Roasted Pecans offers to put rumours of arduous prep time to rest and then does another good turn by serving up a host of colourful flavours with as many subtleties and textures as a Degas painting; the corresponding photo of the dish certainly promises a lushly rich impressionism of epicurean delight. "Lisa has let me in on a little Chef's secret: Risotto is easy. Good rice, a hot stock and 20 minutes of frequent stirring are all it takes to make this creamy, dreamy dish of caramelized roasted sweet potatoes folded into Parmesan, thyme, and white wine risotto. Topped with roasted pecans, this no-sweat, restaurant-worthy risotto is easygoing and most-comforting-in-the-kitchen." "Thanks to Lisa and Lionel (as in Richie), we can all be easy like Sunday morning. How so? All you have to do when you wake up is turn on the oven and get your knife and fork ready. Thanks to this overnight (it's assembled a day in advance) Strawberry Cheesecake French Toast Soufflé, you can pull together the most jaw-dropping brunch in no time." Lick Your Plate finds a number of ways to make cooking as painless as possible; the sisters turn efficiency into a creative endeavour. It’s this very approach which much of their fan base has come to recognize as a signifying trait of the Bite Me brand. Both assure that their latest cookbook is for everyone -- from the clumsy novice to the seasoned pro.